If you haven’t paid attention to track the last four years, then this post is for you. If you do pay attention to track, but are interested in the education of your friends, relatives and acquaintances who will dabble in track and field the next couple weeks, then this guide also might also be of some use. For each running event at the Olympics (part one will be men, part two women), I included the date of the final, the key names to know, why you should watch and some talking points. These talking points can be said either before, during or after the event with the intention of making you appear more informed. I’ll keep this intro brief since the commitment to an article about track and field is fleeting. Remember not everyone is doping, but we won’t know that for certain until another ten years or so. Enjoy! Why you should watch: The most dramatic event of the track and field program takes on extra significance this year with Bolt attempting to be the first man to win three straight gold medals in the 100m. Despite his perfect record at the Olympics, there is still some doubt about the outcome. Bolt is working through a hamstring injury and Justin Gatlin has been good enough this year to be considered a viable spoiler. Gatlin is despised by most of Europe because of his doping suspension, which might make him more appealing to an American audience, though most people have found in the last eight years that it is physically impossible to root against Bolt. Trayvon Bromell is only 21 years old and ran many of his collegiate races in distance runner shorts and not tights. Relatability points for him. Jimmy Vicaut plays the role of fast guy from a country who you didn’t think had fast guys. Why you should watch: Assuming he wins the 100m, this will be Bolt’s chance to push his career gold medal count to eight. Conventional wisdom says if he wins the 100m, inertia carries him to victory in the 200m. The 200m is his better event, and Bolt only seems to get more relaxed as the meet goes on. Relaxed = good for him and bad for his competition. Gatlin narrowly edged Merritt at the Olympic Trials and those two are the favorites for silver and bronze. All of the big names will be on their second event of the meet by the time the 200m comes around (except Webb), so there is some amount of unpredictability. 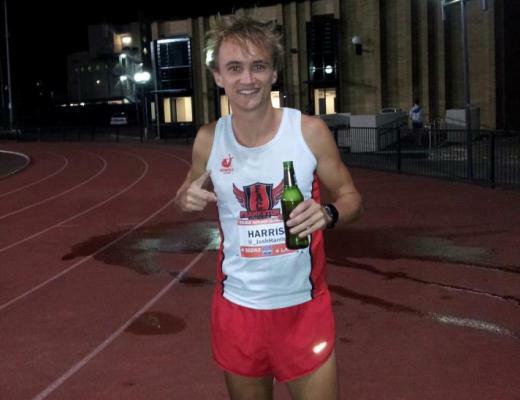 Merritt’s 400m endurance has been extremely helpful as he stepped down in distance this year. He runs the last 100 meters like a toy car stuck in the “on” position, building speed as the wind-up cars around him lose steam in the final meters. Merritt will probably be too far behind Bolt coming off the curve for him to win, but it will be exciting all the way to the line. Why you should watch: The 400m is the shortest event where someone gets taken off on a stretcher for reasons solely related to completing said event. And that was the guy who won. Since last year, this has been a three-person race. Van Niekerk, Merritt and James are the medal men, and if anyone else breaks up that top three, it will be a huge surprise. Because this is track and field, the three haven’t all been in the same race since last year’s World Championships. Merritt has the fastest time of the year, Van Niekerk is the current world champion and James is the reigning Olympic champion. With so few head-to-heads (and no head-to-head-to-heads) it’s hard to say with any certainty the finishing order in Rio. Merritt’s 200m times this year are a nice plus, but Van Niekerk has broken 10 seconds in the 100 and 20 seconds in the 200m. ”Why did (guy who finishes in the third) leave it so late? 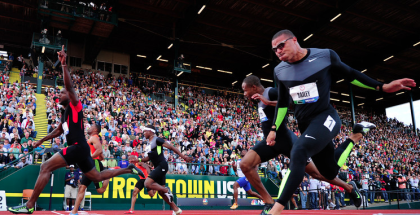 Why you should watch: The 2012 Olympics hosted the greatest 800m in history. The winner, David Rudisha, set a world record and virtually everyone else ran a lifetime best. I know I just described virtually every swimming race at the Olympics, but in track and field it’s extremely rare to see a world record in a mid-distance race. Rudisha is back, and even though he’s not in world record shape, the 800m will be fun because a two-lap race with no lane restrictions can’t help but be interesting. 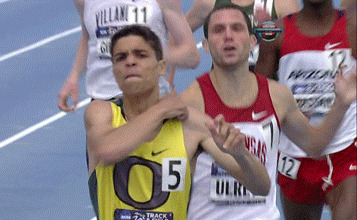 The 800m also features the good kind of tactics — not the kind where the field runs at fun-run pace for half the race. The US could get two to the final, including Boris Berian. He worked at a McDonald’s inside a Walmart two years ago before breaking through in 2015 and posting a top-10 time in the world. Also last year, he vowed to never let Rudisha beat him after Rudisha reluctantly posed for a photo with him. More fun facts: Ferguson Rotich is named after soccer manager Alex Ferguson and Alfred Kipketer got his name from movie director Alfred Hitchcock. That last onet isn’t true. Why you should watch: The 1500m is where we see the other side of tactical racing — more maddening than exhilarating. Slow early laps lead to fast finishes with a good portion of the field still in medal contention at the bell. If that sort of thing appeals to you, the 1500m might be your event. If, however, you are impatient and wonder why soccer players don’t shoot more or why basketball teams don’t press the entire game, then these 3 ¾ laps will be torture for you. Asbel Kiprop is a big favorite. At 6-foot-3, he looks 7-foot-3 compared to the rest of the field. Kenya’s other low-post threat, Elijah Manangoi, is six feet of mostly femur and tibia. The United States has a chance for a medal in Matthew Centrowitz. He once did the throat slash gesture… after it was banned by the NFL. Not sure if the IOC has a policy on excessive celebration. Why you should watch: This event comes after the 10,000m, which means it will likely be Farah’s chance at a second medal. As of now, only two Kenyans are entered. One of them, however, starred in an exceptionally well-produced rap video. Farah should get pushed by the Kenyans and Ethiopians. Nobody in this race is as good as Geoffrey Kamworor is in the 10,000, but the collective group is stronger in the 5000m. There will be talk of team tactics among nations. That sounds good, except the team in question always seems a bit unsure of what tactics are to be utilized when racing against the best distance runner of the era. Also, Bernard Lagat and Paul Chelimo reunion! Why you should watch: It’s the only event where they hand out water during the race (pending weather conditions). Farah and Rupp running 1-2 in London was one of the indelible images of the 2012 Olympics. Farah is as strong he was then and he doesn’t have the pressure of disappointing 80,000 people who filled the stadium this time around. Kamworor is the chief rival to Farah, but he’s never shown the ability to kick like Farah does. I don’t think that changes here. Rupp’s focus on the marathon may leave him a little flat when the pace picks up. Repeating his silver medal performance would be remarkable. Two of the US team members are naturalized citizens who were born in Kenya — just giving you a heads-up in case you want to preemptively unsubscribe from your xenophobic friend’s Facebook feed. Why you should watch: The track and field elitists will tell you this is the most reliably fun event to watch. The best runners compete weekly against each other. In track and field, that is rare. McLeod is considered the favorite and owns the top two times of the year. Allen plays football (not worth any extra points unfortunately) at Oregon and won the US Trials. Ash and Porter should make the finals and either could medal. This race really is wide open. Many of the top 10 aren’t at the Olympics for a variety of reasons. Why you should watch: Also known as the race Edwin Moses ran, and the event where Robert Griffin III made the semifinals at the 2008 Olympic Trials. Neither are in this race, but I bet you recognized both of those names. The US has a good chance at two medals. If you like devastating, soul-crushing stumbles in the last 50 meters, the 400m hurdles is your race. Why you should watch: This is one of the morning finals from Rio so employ the same strategy you use to watch March Madness to sneak a peek at Evan Jager vs. the Kenyans. It will only take eight and a half minutes tops, so I don’t think you’d be putting your employment at risk. Jager threatened to break the Kenyan dominance in this event last year, but he didn’t run his best race at the World Championships. Can he break into the medals this year? If not, it’s probably another Kenyan sweep. Mekhissi-Benabbad has made the podium before but missed last season with an injury. Among the Kenyan contingent, Kemboi is the most decorated. He also runs like he is possessed. By what, I’m not sure anyone knows for certain. Huge surges, times all over the places, finishes in lane seven, dances, post-race squabbles. What more could you want from a Kenyan steepler? Why you should watch: Even if Bolt is coming off two gold medals in the individual events, the United States has a chance for an upset. The US has a slight edge on Jamaica with runners 2, 3, 4. Projections like that haven’t helped the US in the past. They have more DQs than gold medals since 2007. Even in 2012, when they got the stick around and broke the American record, Jamaica set the world record to beat them… And then the US had to give their medals back when Tyson Gay tested positive. The fault, dear Brutus, is not in our stars, but in our batons. Why you should watch: On the chance that the US struggles throughout the meet, they still have the advantage of playing “next score wins” in the last event on the track. One victory doesn’t entirely cover up for a bad meet, but there is nothing like winning a 4 x 400 by two seconds to make you feel better. Here’s a stat: the US men crossed the line first in every 4 x 400m Olympic final they participated in from 1956-2008. In 2012, Bahamas upset the US and turned the sporting world on its head. Not really. In that race, injury kept their best runner, LaShawn Merritt, off the team. This time around they are fully healthy and nobody can challenge them. The Bahamas have the coolest nickname in the meet — the Golden Knights. Why you should watch: It’s the last event of the track and field program on the final day of the Games. Kenya and Ethiopia are strong as per usual, but the US has potential to grab a medal. Galen Rupp will be on a mission/on a high after his struggle/success in the 10,000m. It’s extremely rare for someone to compete in those two events at the Olympics, so how his legs hold up is a genuinely interesting storyline. In the Olympic Marathon Trials, he cut holes in his jerseys to stay cool. I think there is a law preventing from him doing that to a US jersey. Ethiopia is like the Knicks here, randomly throwing talent on their team without a discernable thought of how it will work out in the end. They rely heavily on season-best marks to pick their Olympic team. This seems like a good idea on paper, but there are so many variables in the marathon that it requires a bit more thought than simply pointing at a list of fast times. The Europeans despise Gatlin for his doping suspension. Hm. Didn’t Jean-Paul Sartre invent doping? Nijel Amos? Where is young Nijel? Can’t do without Ol’ Janky in the 800m! “Ethiopia is like the Knicks”……LOL!! !